So your orchid got an AD … is that a virus, or some kind of Attention Deficit thing? The term OSCOV has been demystified in the above article but some members are still trying to come to grips with other abbreviations such as FCC, AM, AD, and so on. 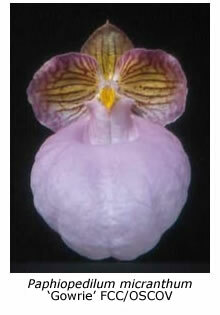 Hence, this article on orchid awards. Most of us will be aware of the judging that takes place at orchid society shows, where the OSCOV Judging Panel considers the plants and grant first, second and third places in the various classes, and then goes on to select champions in larger groups, and ultimately, an overall champion. At many clubs, judges are also used at the show bench on meeting nights. The OSCOV Judging Panel also makes awards to plants in order to acknowledge excellence. Worthy plants might be encountered by the judges at a show or a club meeting but they can also be brought to the attention of the judges outside of these venues. At least five judges need to be present to grant an award (all five must be in favour of the award). We refer to this as Award Judging. When award judging, there are a number of awards that can be conferred. These are generally referred to by their abbreviations, and there are two main groups of awards made by OSCOV, as listed below. A special plant could be granted both a Quality and a Distinctiveness award at the same time. FCC (First Class Certificate): This is the highest quality award available. It is awarded to plants that score 85% or more when allocated points according to Shape & Substance, Colour & Texture, Habit & Arrangement, and Size & Floriferousness. An FCC is extremely rare, there having only been two ever awarded by OSCOV (to Brassolaeliocattleya Mount Sylvan ‘David Littman’ in 1998 and to Paphiopedilum micranthum ‘Gowrie’ in 2003). AM (Award of Merit): A plant needs to score 80 to 84.9% to obtain this award, which is a fine achievement, and takes considerable effort to attain. HCC (Highly Commended Certificate): The HCC is granted to a plant scoring 75 to 79.9 points. The great majority of awarded orchids receive this award, which implies that, while the flower is outstanding, there is still some room for improvement. 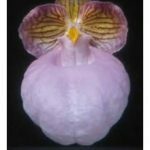 AD (Award of Distinction): This award primarily recognises worthy new trends in orchid breeding, and can be made for a specific outstanding characteristic such as colour, flower size, floriferousness, etc. AQ (Award of Quality): Also primarily to recognise superior breeding, this award may be made to at least five high quality siblings of one grex raised from a single seed capsule by the same grower and shown together. At least one of the plants should be worthy of a quality award. CBM (Certificate of Botanical Merit): Can be awarded (once only) to a well established and flowering species or natural hybrid that is rare in cultivation. CC (Cultural Certificate): This is an award that recognises the skill of the grower rather than the characteristics of the plant. 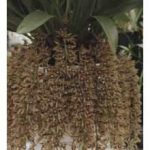 It is available to the grower of an orchid that is clearly superior in flowering, size or robustness and cleanliness of growth to that which could reasonably be expected for a mature plant of its type. The recipient must have grown the orchid for at least two years. Some individual societies also award their own Cultural Certificates (referred to as Club Cultural Certificates). 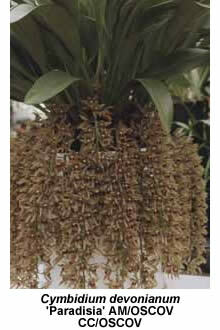 The various State and National Orchid bodies throughout the world have similar award systems, although they may differ slightly in names and details. When a plant is awarded, the owner is entitled to place some letters (post-nominals) after the name of the plant as a reminder of the award attained. These are normally written in the form: FCC/OSCOV (First Class Certificate from OSCOV), AM/RHS (Award of Merit from the Royal Horticultural Society), or maybe even SM/JOGA (Silver Medal from the Japan Orchid Growers Association). So … if your Cymbidium Kirby Lesh ‘Kerang’ is awarded an FCC by the OSCOV Judging Panel, you would then write its name as: Cymbidium Kirby Lesh ‘Kerang’ FCC/OSCOV. Receiving an OSCOV quality award triggers another process. The plant is automatically entered in the annual Victorian Orchids of the Year competition, where it is presented before the judging panel for consideration as Victorian Cymbidium of the Year, Victorian Paphiopedilum of the Year, and so forth. The overall winner is adjudged Victorian Orchid of the Year. I trust that this provides at least a little insight into the award system. Those of us who haven’t had an orchid awarded yet might be motivated to select a plant we are growing reasonably well, and raise it up into a nice specimen that might win us a cultural certificate … and who knows where else that might lead?